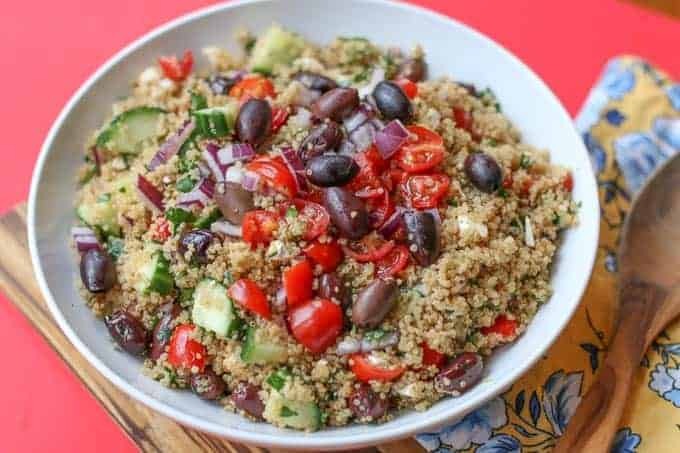 Mediterranean Quinoa Salad is mixed with olives, feta cheese, Kalamata olives, tomatoes, cucumbers, and a vibrant flavored lemon dressing. It is perfect as a delicious side dish or as a healthy entree by itself. I absolutely love quinoa. It is such a healthy substitute for rice or pasta. It is packed with protein, fiber, minerals, amino acids, and antioxidants. It is also low on the glycemic index, so it doesn’t dramatically raise your sugar level when eating it. 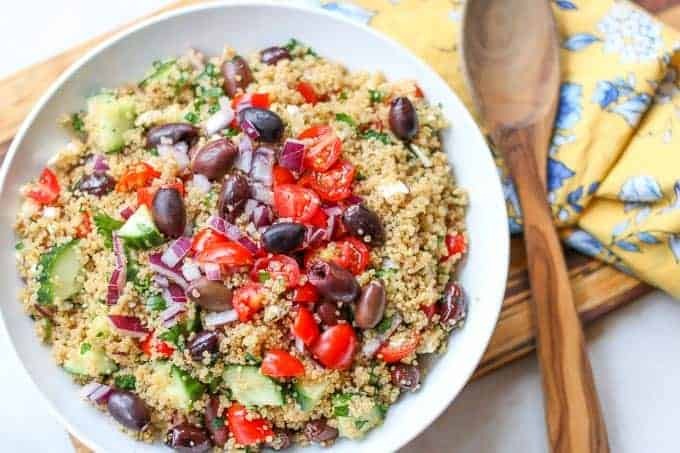 This Mediterranean Quinoa Salad is one of my favorite ways to eat quinoa. It is loaded with all my favorite toppings like feta cheese, Kalamata olives, and tomatoes. I like to whip this up when I have my friends over for a girls luncheon. It is so pretty and flavorful. They just love it. It makes a lovely side dish for a back yard barbecue also. Mediterranean Quinoa Salad is definitely one of my husband’s favorite salads. He eats it by the bowl full. Sometimes I bake a piece of salmon with it or grill some shrimp. Grilled chicken kabobs would go nicely with it also. 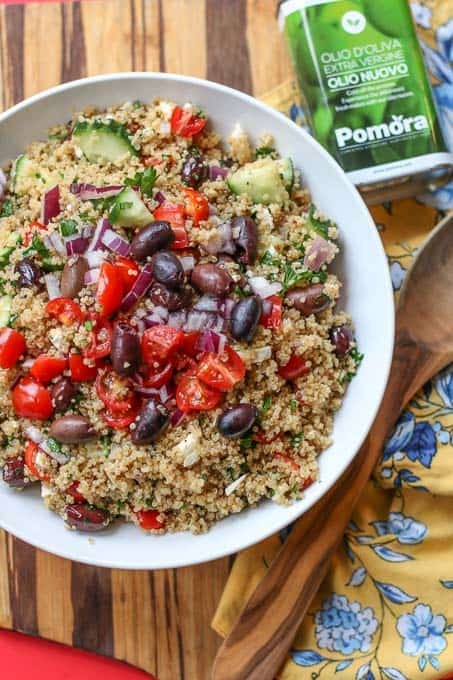 What really makes this Mediterranean Quinoa Salad flavor pop is the lemon salad dressing. To make the lemon dressing, I use Pomora Olive Oil to make it for it’s quality and richness. You can see it’s beautiful color in the picture. The flavor is glorious. 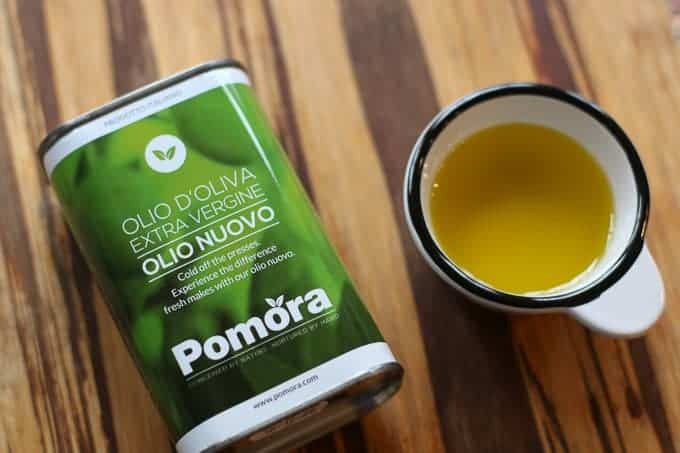 Pomora Olive Oil sends their olive oil straight from the growers in Italy. There isn’t a middle man. The result is an organic, incredible tasting olive oil. Other store bought olive oils just can’t compete in the quality. I use it on EVERYTHING. If you are looking for the perfect gift for the foodie in your life or if you want an AMAZING olive oil, I suggest trying Pomora Olive Oil! Pomora Olive Oil is giving away a set of 3 of these Extra Virgin Olive Oils. To enter, visit my Instagram Page here. Contest ends February 21,2019. I hope you enjoy this flavorful Mediterranean Quinoa Salad as much as our home does. If you do, be sure to also check out these delicious dishes: Spanish Orzo Salad, Mediterranean Tuna Pasta Salad with Capers and Olives, and Cucumber and Dill Salad. Cook quinoa according to directions with the vegetable broth. Cool and set aside. Add parsley, olives, cucumber, onion, tomatoes, and feta to the quinoa. In a separate bowl create dressing: Mix together olive oil, lemon juice, garlic, salt and pepper. Pour lemon dressing mixture in quinoa salad and mix well. Enjoy!